In order to distinguish specific from non-specific bands of the sample material, always run a control on every blot, in which only secondary antibody conjugate without primary antibody is applied. The secondary antibody should not be used at too high concentrations. In most applications the secondary antibody can be used in dilutions well above 1:10.00 while higher concentrations may favor nonspecific background binding. As a guideline, in comparison to color substrates the secondary antibody dilution can be doubled when ECL-Substrates are used. The optimal dilution may also vary with different batches of secondary antibody. Bovine milk powder is frequently used as blocking reagent in Western blotting, but sometimes it can also be the source of unwanted background. In order to reduce the background reaction of the secondary antibody with bovine Ig in milk powder the use of secondary antibodies adsorbed against bovine (MinX Bo) or human (MinX Hu) Ig / serum proteins is recommended. Other measures to reduce non-specific background include blocking with 5% normal serum from the same species as the secondary antibody or with IgG-free BSA (Cat. No. 001-000-161 / 2). Often, switching to normal serum as blocking reagent for problematic blots efficiently leads to cleanest results. Generally, the secondary antibody should be diluted in buffer without protein base such as milk powder a.o. in order to exclude reactions of the secondary antibody with immunoglobulins or proteins present in the protein supplement. This is particularly important for anti-goat conjugates (see 4.). Anti-goat secondary antibodies from the host species donkey, rabbit, and mouse highly cross-react to bovine immunoglobulins, for example in milk powder. If the secondary antibody dilution buffer contains milk powder, almost all of the anti-goat conjugate will be adsorbed by bovine Ig. This leads to either a complete lack of signal or a faint signal, if the conjugate is applied at high concentrations. Additionally these conjugates may produce background on the blot, if bovine milk powder was used for blocking. For the detection of goat primary antibodies on Western blots, we recommend anti-goat from bovine (cat. 805-xx5-180). Production of anti-goat antiserum in the very closely related host bovine results in antibodies with no cross-reactivity to bovine Ig / serum proteins. In the following article you can read how background bands caused by precipitating immunoglobulins on the blot can be avoided when using secondary antibodies for Western blot detection. One of the most common problems in immunoblotting (Western blot) using secondary antibodies for indirect detection are background bands caused by antibodies in sample preparations originating from, e.g. immunoprecipitation, cell-or tissue-own immunoglobulins in the lysate or contamination with bovine immunoglobulins (FCS in cell lysates, BSA, etc.). The antibody heavy and light chains slotted from the sample after reducing SDS-PAGE display bands at 50 kDa and 25 kDa, respectively. Under non-reducing conditions gamma immunoglobulins (IgG) show a band at approximately 150 kDa. Paying attention to this issue is most important in immunoprecipitations (IP); especially after immunoprecipitation when the target protein is expected in the range of 25kDa or 50kDa this issue must be addressed. The problem of antibody background bands after IP can completely be bypassed by using directly conjugated primary antibodies for the detection of the target protein. However, labeled primary antibody is often not available, so that an unconjugated primary must be detected with a secondary antibody conjugate. One possible way to prevent antibodies from being blotted after immunoprecipitation includes crosslinking antibody to Protein A/G-coated beads or covalently coupling antibody directly to treated beads. However, in order to avoid antibody contamination using this approach, eluting the antigen under non-denaturing conditions is crucial, as otherwise the denatured antibody fragments will be eluted with the antigen. 1. are from different host species. Background bands of the precipitating antibody on the blot can be avoided by secondary antibodies without cross-reaction (MinX) to the species of the precipitating antibody. > Secondary antibody anti-mouse IgG (H+L) MinX Rabbit etc. (e.g. cat. 115-035-146). By the selection of a secondary antibody that is specific for the sub/class of the primary detecting antibody the recognition of the precipitating antibody on the blot can be avoided. > Secondary antibody anti-mouse IgG2a (e.g. cat. 115-035-206). b. the target protein is near 50 kDa. Secondary antibodies against the light chains of mouse IgG do not react with the reduced and denatured heavy chain (50 kDa) of the precipitating antibody. They only bind to the reduced, denatured light chain of the precipitated antibody on the blot (see Figure) and to the native light chains of the primary antibody used for detection. Therefore, a 50 kDa protein may be detected on blots without interference from the precipitating antibody. Only one antibody band in the region of the light chains, but not in the range of the target protein is detected. 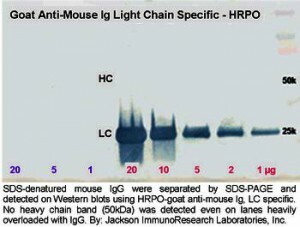 > Secondary antibody anti-mouse Ig/G light chain (e.g. cat. 115-035-174). c. the target protein is near 25 kDa. Secondary antibodies against the Fc fragment of mouse IgG do not react with the reduced and denatured light chain (25 kDa) of the precipitating antibody. They only bind to the reduced, denatured heavy chain of the precipitated antibody on the blot and to heavy chains of the native primary antibody used for detection. Therefore, a 25 kDa protein may be detected on blots without interference from the precipitating antibody. Only one antibody band in the region of the heavy chains, but not in the range of the target protein is labeled. 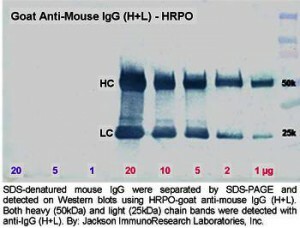 > Secondary antibody anti-mouse IgG Fc (e.g. cat. 115-035-071). Note: If the primary antibody recognizes its target protein in non-reduced form and if the target protein related to its size etc. can be displayed in the SDS-PAGE, the sample may be applied without reducing reagents. The primary antibodies used to precipitate then forms only one antibody band at 150 kDa which does not interfere with the detection of target proteins outside this molecular weight range. Anti-Ig/G light chain specific antibodies react with native primary antibodies used for the detection of proteins in Western blots. If applied in an appropriate dilution they do not bind to the reduced and denatured IgG heavy chain band (50 kDa) on blots. This makes them ideal for the indirect detection of antigens near 50 kDa after immunoprecipitation, where large amounts of reduced and denatured IgG heavy chain can obscure the detection of the target protein. Although the anti-light chain specific antibodies show a strong reactivity with native IgG light chains in Western blot, the reduced and denatured form on the blot may not be recognized as sensitive. We therefore do not recommend using the antibodies for a sensitive / quantitative detection of IgG light chains by Western blotting. In order to prevent cross-reactions to immunoglobulins from other species which may be present on blots, the antibodies have been adsorbed to serum proteins from many other species. Target proteins near 25 kDa may be detected indirectly after immunoprecipitation without any interference in this range by using anti-IgG Fc fragment specific antibodies, because they do not react with the reduced and denatured antibody light chains on the blot. Alexa Fluor® 680 is a far-red-emitting dye with peak excitation at 684nm and peak emission at 702nm. Alexa Fluor® 790 is an infrared-emitting dye with peak excitation at 783nm and peak emission at 803 nm (Figure 1). Fig. 2 :Excitation and emission spectra of Alexa Fluor® 680 (left)- and Alexa Fluor® 790 (right)-conjugated secondary antibodies. All peaks were normalized. Spectra were obtained with a M-Series spectrofluorometer from Photon Technology International, Inc. and an Ultraspec 1100 pro from Amersham Biosciences (Fig. Jackson ImmunoResearch). Here you will find our Western Blot Troubleshooting Guide.